choice of concrete masonry units (CMUs). This elevator shaft—the first in the country to be made from CLT—will be 14 m (45 ft) tall on completion. CLT—a focus in the forthcoming February 2017 issue of The Construction Specifier—comprises several layers of lumber boards, stacked crosswise and bonded. This increases the panels’ mass, as well as their stability and rigidity. By implementing this strategy, the project team achieved a number of advantages related to time and cost savings. For instance, with CMU, inspection is required every 2.5 m (8 ft), while with CLT, this is done in the framing inspection. The CLT method can also cost only 70 to 75 percent of the traditional option, as it cuts down on materials and labor. Where the traditional CMU method would take three weeks, the work of eight to 12 people, and equipment for stacking and curing to complete, using CLT allows for onsite assembly by three people with a crane, and can be done in a matter of hours. In part, this is due to its prefabrication process, which renders it immune to concerns of weather and frost. This method will also improve the structure’s environmental performance, reducing its greenhouse gas (GHG) emissions through the use of an alternative to concrete, which is responsible for five percent of world carbon dioxide (CO2) emissions. 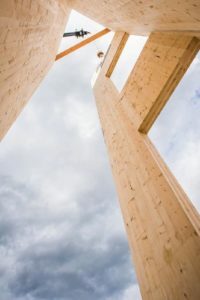 Wood is the only renewable building material, and the only structural building material whose origins can be certified as sustainable by third-party programs. The process of cross-lamination enhances CLT’s ability to perform well structurally. It improves the wood’s dimensional stability and shearing strength to create an effective lateral load-resisting system with high seismic resistances. A seven-story CLT building tested on the world’s largest shake table in Japan, for example, survived 14 consecutive seismic events and suffered almost no damage. The thickness provided by the cross-section in CLT also enhances the system’s fire resistance. CLT’s increased mass causes its panels to char slowly, until the oxygen source is removed and combustion must stop, and provides fewer concealed spaces for fire to spread undetected. This method also demonstrates good ductile behavior and energy dissipation. The Whitefish elevator shaft took 3.3 hours to erect, and will be completed in the spring.